You’ve just retired, and your portfolio is your main source of retirement income. How should you invest, and how much can you safely withdraw from your nest egg? Bill Bengen, an obscure advisor in El Cajon, California, attempted to answer that question some 20 years ago: Maintain a mix of 53% stocks and 47% bonds, rebalance annually. Start by liquidating 4% of your portfolio balance the first year, then adjust that dollar amount upward by the rate of inflation (CPI). With that approach, Bengen contended, odds are high that your portfolio will last at least30 years. Bengen went on to add additional asset classes, and eventually raised his starting point recommendation to 4.5%. But his original series of papers were popularly enshrined under the moniker of "The 4% Rule." In the 1990s this rule seemed too conservative, and today some would argue that it’s too aggressive. But after running our own evaluation starting at the end of 1976, using Puritan as a stand-in for Bengen’s 53/47 stock/bond portfolio, we’ve concluded that 4% is a solid starting point that’s unlikely to result in disappointment down the road, even in the current era of reduced expectations. 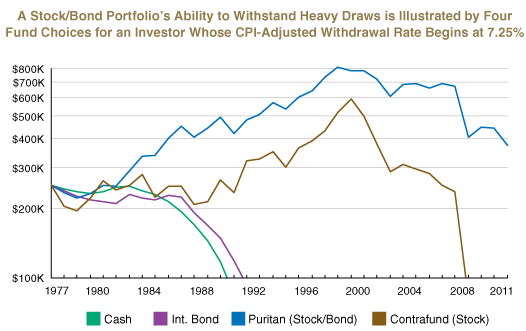 The longevity of a portfolio with annual living expense withdrawals, rising in tandem with the CPI, is affected more by the rate of inflation than by the returns that are attainable in the stock and bond markets. Bengen’s worse-case 30-year period, the one that actually defined the 4% rule, starts in 1969 with two bear markets only about five years apart, followed by surging inflation and interest rates. The cost of living hikes rapidly increase the burden of living expenses on the portfolio, causing them to reach double-digit levels seven years after the retirement period begins. In contrast, an investor retiring in the year 2000 with a 4% starting draw would only be liquidating at a 6% rate today. While investment returns have been worse over the more recent 12-year period, they haven’t slipped far behind inflation like they did from 1969-1981. An all-cash portfolio, which may seem the most safe to some, fails to keep up with rising living expenses at a time when inflation is surging. If money market returns and inflation were perfectly matched, the 4% rule would allow your portfolio to cover 25 years of living expenses. But starting in 1976, just before inflation becomes a major problem, the cash option lasts only 16 years. An all-bond portfolio is often the pick of conservative investors who want to maximize income. But in a situation where yields start out low relative to inflation, and interest rates later rise, a 100% position in Fidelity Intermediate Bond lasts only one year longer than the all-cash option. An all-stock strategy is usually the favorite of those who want to maximize wealth-building. And in a situation where there are no living expense demands, this option almost always provides the best performance over long periods of time. But when the withdrawal burden is heavy and a bear market hits, you can reach a point of no return sooner than you might expect. In this example, even with a stock fund that has a good long-term track record (Fidelity Contrafund), the money still runs out in just a little over three decades. The stock/bond option stands the test of time better than any single asset class. Stocks and bonds only rarely take a dive at the same time, limiting the magnitude of a loss in the short-run. And rebalancing allows for buying low and selling high, much like dollar cost averaging. Using Fidelity Puritan for this example (its mix is typically 60/40), the portfolio is still hanging in there after 35 years of heavy withdrawals (for clients invested in our most conservative stock/bond portfolio, we use a stock/bond mix that’s closer to Bengen’s 53/47 allocation). For those with the flexibility to deviate from an inflation-adjusted income stream, it may be possible to extend your stock/bond portfolio’s life significantly. By starting at 4% and limiting the annual inflation adjustment to 3% or less gives you good a good shot at making your portfolio last 50 years or more. And if you further limit the annual draws so they never exceed 4% of your portfolio’s value, the stage may be set for your nest egg to provide for an indefinite period. A worldwide economic slowdown caused the Euro-zone debt crisis to intensify once again, this time over Greece’s potential exit from the common currency and the implications of rising sovereign debt yields in Italy and Spain. As economic growth turned increasingly negative for the Euro-zone, Germany (which has long opposed any efforts aimed at spreading sovereign debt credit risk or strengthening the ECB) began to soften its position, sparking a market rebound near the end of the quarter. On the natural resource front, fears of scarcity gave way to inventory surpluses, causing a large correction across many commodities. On the domestic front, declining interest rates, bargain hunting, and foreign buyers gave a lift to residential real estate, but job growth and manufacturing output slowed. The S&P 500 declined 2.8%, finishing the second quarter with a year-to-date return of 9.5%. European policy-makers appear to be taking their financial crisis a bit more seriously these days, making it more likely they will work together on a long-term solution. But the credit crunch they created by delaying moves to share sovereign debt credit-risk is now taking a deep toll on the European economy, and is weighing on global growth as well. Fortunately, there are some positive side effects. Here at home, consumers are seeing relief at the pump, which is likely to persist for the foreseeable future. And the Fed, which recently extended Operation Twist until the end of 2012, now has plenty of inflationary headroom to take further action if necessary. The so-called “fiscal cliff” has been making waves in the media. Some pundits are quite worried about the impact of the end-of-year expiration for the Bush tax cuts and the Social Security tax break, as well as the imposition of a new investment tax to fund Obamacare. Butas we saw last year with the debt ceiling / treasury default scare, politicians often work together when they know they must. Odds are there will be some sort of compromise after the November elections, maybe even sooner. Even if that doesn’t happen, odds are the Fed would step up to the plate on the monetary side to compensate for any lack of fiscal stimulus. As such, we don’t see a need for big changes in our strategy going forward, though we are looking at a few adjustments. For stocks, we’ll continue to emphasize U.S. equities, focusing bit less on export growth and a bit more on dividends (the latter has been weighed down by the expectation of sharply higher tax rates). On the bond side, we may boost our exposure to emerging market bonds (which are largely investment-grade rated and dollar denominated), as this asset class could benefit as inflationary pressures ease in emerging countries.